One of the trade-offs that Microsoft has made with the Surface Pro 4 is a reduction in battery capacity. Ever since the first Surface Pro was launched, Microsoft has equipped it with a 42 Watt-hour battery. That is a large size for a tablet, but the Surface Pro has always been a larger than normal tablet too. With the Surface Pro 4, the battery capacity has been reduced slightly to 39 Wh. Part of this is the thinner chassis, and part of it is the new hybrid cooling which puts a copper plate over the battery. I can’t argue with the new cooling system, since it has clearly made a big difference in thermals. To take a look at battery life, I’ve run both our tablet battery tests and our notebook battery tests. As with all of our battery life testing, the display is set to 200 nits for a consistent result across devices. Looking at our tablet web browsing test, the Surface Pro 4 comes in right around the same battery life of the Surface Pro 3, running out of power about 13 minutes sooner. When you think about the move to Skylake, this could be taken as a disappointment, and I honestly thought it might be able to get a bit more. But the smaller battery capacity and increased pixel density both negatively impact batter life despite the CPU using a bit less power itself. I would have loved to see the larger battery stay, which would have given it about 8.5 hours, but the improved cooling system is likely a better trade-off compared to around 30 minutes of battery life. Once we shift to a more CPU-intensive workload however we start seeing significant gains. 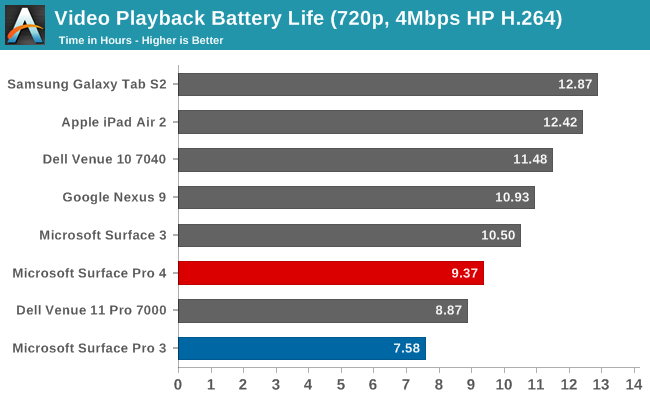 Intel has been making good progress on their video decode power consumption since Haswell, and the Surface Pro 4, despite the greater pixel density and a smaller battery, achieves 23% longer battery life than the Surface Pro 3 at this task. 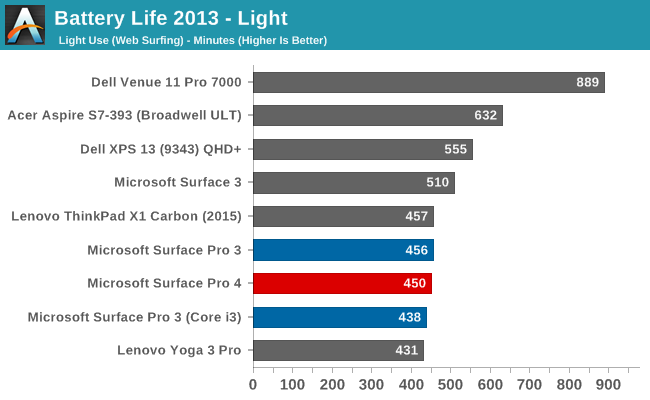 This is a great result and puts the Surface Pro 4 more in line with what traditional ARM based tablets can achieve. 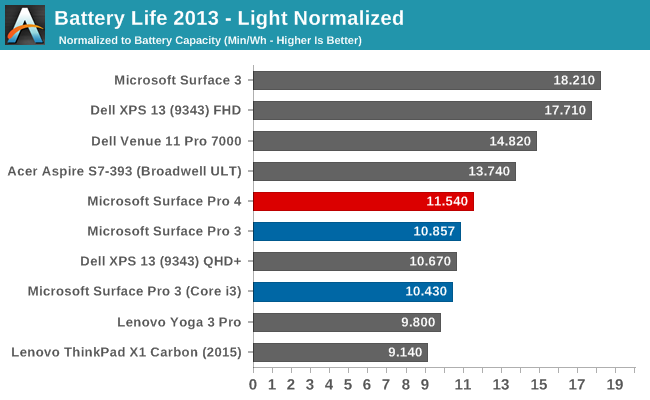 Once again the Surface Pro 4 falls right in line with the previous generations for battery life, which means that the efficiency has been improved even though the panel is much denser. While certainly not class leading in overall life, for the size of device and performance available, it is a pretty good result. Being able to keep battery life flat, while improving the display resolution, and making the device thinner and lighter, is in line with what you would expect as they pack more and more power efficient parts into the Surface Pro 4. 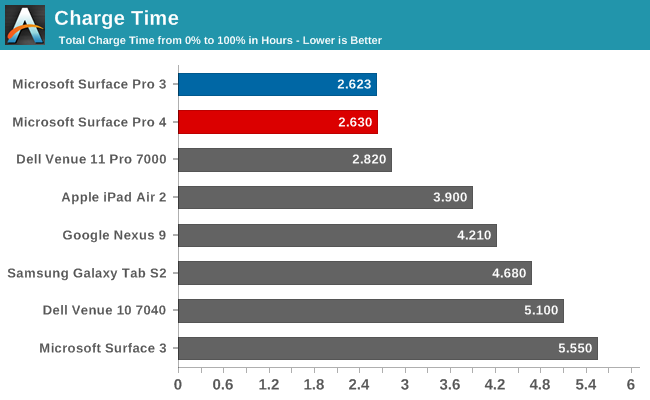 Under our heavy battery life test we can really see the improvements with Skylake. 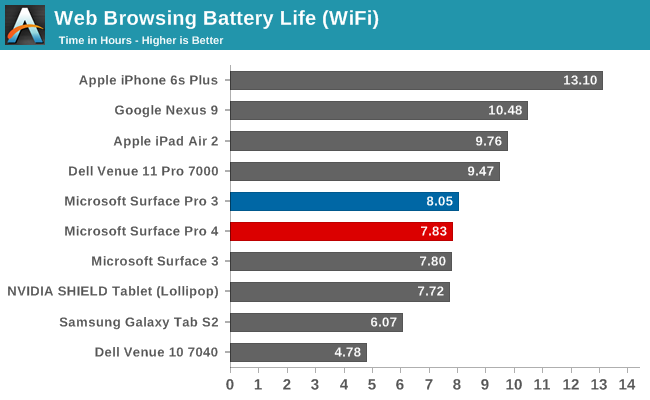 The Surface Pro 4 battery life score on our heavy battery life test outlasts the Surface Pro 3 by 21%. The heavy test involves video playback, which we have just seen in the tablet workload is significantly improved, as well as a much higher web load and a 1 MB/s file download. 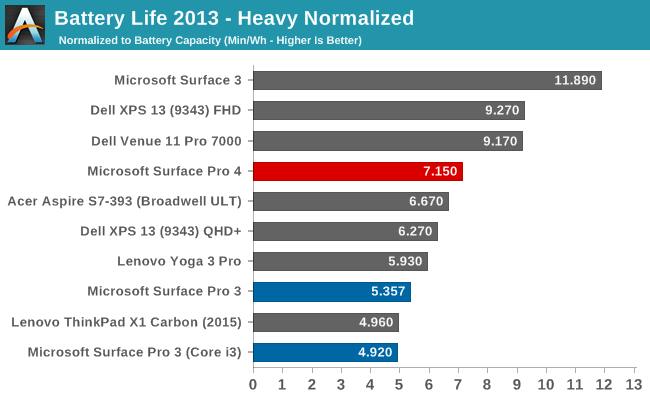 Once again, the Surface Pro 4 is not going to be able to compete with notebooks with much larger batteries, but for the size and weight of the device, it is a good result. Next up let’s break down our results by energy efficiency. The XPS 13 is the class leader in battery life at the moment, but it achieves this with the 1920x1080 display. 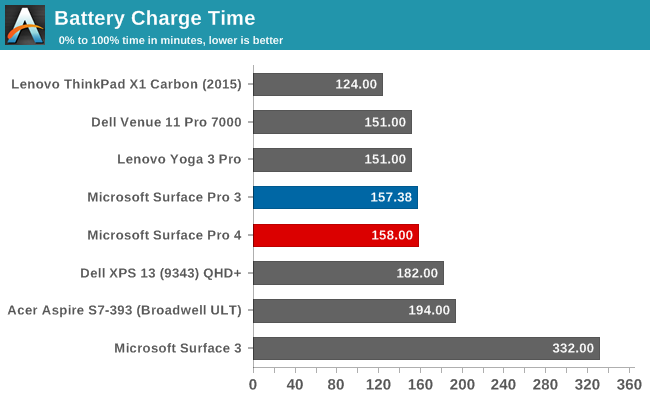 In order to be more comparable to the Surface Pro 4, the graph shows the higher resolution 3200x1800 version which was still able to get some pretty good battery life scores. 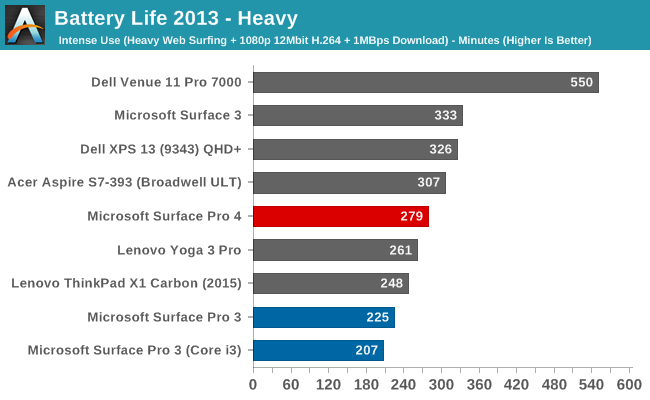 The Surface Pro 4 manages to be more efficient than every other high resolution device we have tested, although lower resolution devices are still able to offer greater overall efficiency. Microsoft has kept the same charging system from the Surface Pro 3, with the Surface Connect port providing the connection. This hasn’t changed since the last model, but I do like the magnetic connector and how well it always attaches. I kind of wish Microsoft had added a USB-C here as well, but the Surface Connect port is a pretty nice implementation. Unsurprisingly then, the charge time does not change very much at all compared to last year’s model. I recorded a 158-minute charge time with the standard charger. Microsoft also offers a higher wattage 60 W version for use with the Surface Book, and you can also purchase it as an accessory for the Surface Pro 4. The result with that charger? 158 minutes. 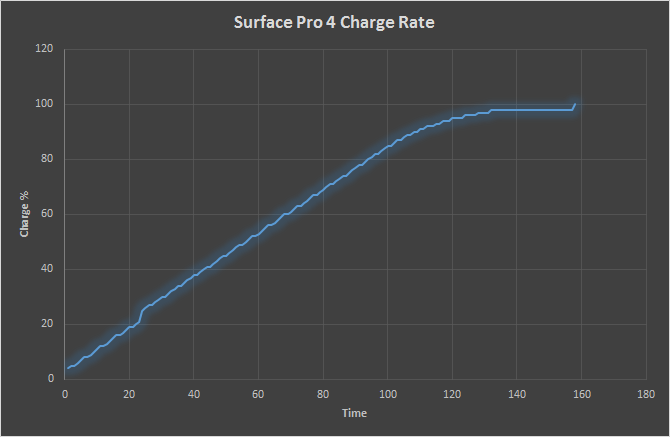 The Surface Pro 4 did not dump any extra power to the battery at all with the higher wattage charger. Once other nice part of the Surface Pro 4 charger, which also carries over, is the included 5 W USB port on the charger itself, so you can charge up your smartphone without burning two outlets. It’s a small thing, but when you are at a hotel where outlets on the desk are at a premium, it’s nice to be able to do this.